#woodenboat – Wood used to be the material of choice for boat-building. But it has long since been superseded by glassfibre and other variations of plastic, while aluminium – for more than two centuries the "metal of the future" - is now widely accepted for small boats which get rough usage but little maintenance. Yet wood still talks to us. It's part of what we are. W M Nixon takes a look at some current Irish wooden boat-building projects. It's one of the most natural things in the world to feel an affinity for wood, and enjoy working with it. It's right there in our DNA. Back in the mists of time, when early man was emerging from a primitive wandering existence, the ability to make fires and tools and weapons with wood, and even better the ability to create a shelter from wood when no cave was available, could make all the difference between life and death. Those early humans who saw wood as something beyond the means merely to make a fire had a superior inbuilt survival mechanism. This in time evolved as an instinctive fondness for wood, a positive emotional response to working with it. Even nowadays, when we live in a world dominated by synthesised materials and mass-produced objects, simply going into a traditional woodworking shop or boat-building shed triggers a favourable atavistic response. We feel comfortable. We love to run our hands along the timber, and savour its aroma. Our heads may tell us that plastic and metal work better for many regularly-used objects, but our hearts are still in love with wood. Any boat-building project in Ireland will always attract a level of interest way beyond the size of the boats involved if the boat is being built in timber. Don't get me wrong, though. Glassfibre is undoubtedly a wonderful boat-building material which – uniquely – is created as the boat is being built. And I've been using a lot of it in the epoxy version in my own boat's re-configuration project. But while you appreciate its excellence intellectually, there are very few people who respond with favourable emotions to the sticky business of working with it, which is something best done as clinically and cleanly and quickly as possible. Pure working with wood, on the other hand, is just so comfortable, so reassuring. You can happily linger over it. You never find yourself wondering if this is what nature intends you should be doing. On the contrary, in working with wood, we fulfil a natural imperative. And little wooden boats of traditional shape are a special joy. Not least of their special joys is that, as we emerge from recession, building a small wooden boat has all the pleasures of traditional boat-building, yet with manageable expense. Thus a classic ten foot clinker dinghy perfectly fits the bill in these straitened times. And as she has the impeccable pedigree of being to a design by the great Colin Archer of Norway, the excellent value for money is beyond dispute as this little boat nears completion in a hidden shed in the depths of Fingal. But the actual working with wood can be every bit as important as the classic or modern nature of the design, and equally intriguing is the City One project in Limerick. There, people who otherwise mightn't get a chance to build a boat, let alone sail one, are much involved with building modern dinghies to a design by Theo Rye. This is being done in a project under the Ilen umbrella, the Ilen being the Conor O'Brien ketch of 1927 which the Ilen Trust is restoring with trainee shipwrights. The new City One performance dinghy for Limerick has been designed by Theo Rye. Over on the East Coast, a boat with distinctive neighbourhood sailing connections can provide a very tangible focal point where a sense of place is sometimes difficult to discern in the region's increasing urbanisation. In Bray, they're reviving that seaside town's local sailing traditions by building new boats to the 12ft Droleen design, which was designed specifically for Bray small boat enthusiasts by local sailing man W Ogilvy way back in 1897. Ogilvy's original designs had faded, so quite some time ago the Bray people got the late O'Brien Kennedy to re-create them, and the result is such an attractive and able twelve footer that they've not only built the first new one to acclamation in Bray, but across in Spiddal on the Galway coast that renowned boat-builder Jim Horgan of Galway Boatbuilding School – who has created an astonishing total of 200 wooden boats in his time – has built another Droleen for general use in Connemara. It has proven "such a neat little boat", as he so aptly puts it, that another is likely in the near future. The Asgard dinghy is a replica of the little boat which Colin Archer designed and built in 1905 for Erskine and Molly Childers to be the tender for the newly-married couple's wedding present from her father, the 51ft ketch Asgard which became part of Irish history with the Howth gun-running for the Volunteers in July 1914. Asgard is now conserved, and is the centrepiece of a simple yet very effective display in the Collins Barracks museum in Dublin. But as John Kearon and his team neared the completion of their excellent conservation project, the economic recession struck home, and it became clear that Government funds would not run to fitting any sort of rig to the boat. However, a new squad of Volunteers emerged from a wide variety of sailing backgrounds in the hope of putting some kind of rig in place in order to give a better idea of what Asgard looked like in her prime, using spars which included the original mainboom. There was no stopping this team, which is not surprising when you consider it included global circumnavigator and former dinghy champion Pat Murphy, Arctic explorer and voyager Paddy Barry, long distance solo sailor Mike Alexander, multiple inshore and offshore sailing champion Neville Maguire, and intrepid sailor/boatbuilder Wally McGuirk and his son Rory. Thanks to their work, despite the limited headroom in the Asgard Museum we now have a much better idea of how this wonderful vessel looked in her prime. But as she is so permanently installed as a national monument in Collins Barracks, there's no way she's going to be readily moved for anything, not even the Centenary of the Howth Gun-Running on July 26th this year. So the new Volunteers began to think of building a replica of the Asgard dinghy, whose basic plans were discovered by John Kearon in the Colin Archer archives in the Norwegian Maritime Museum in Oslo. Though they'd made a fine job of Asgard's shortened display rig, they didn't see themselves as qualified boatbuilders for the detailed construction of a classic little clinker dinghy. But fortunately Fingal boatbuilder Larry Archer – and no, he's not Colin Archer's great-grandson as some have surmised – has the necessary traditional skills in abundance, even if he is noted as one of the pioneers of glassfibre boat-building in Ireland. In fact, Larry is the classic illustration of my point that much as we acknowledge the sheer good sense of quality boat-building in fibreglass, there is still nothing so profoundly satisfying as traditional boat-building in wood. So he agreed to build a replica of the Asgard dinghy in a manageable budget, and as the boat nears completion, Pat Murphy has raised the money from Asgard well-wishers, and businesses in the Howth area. Asgard as seen from the dinghy during a cruise around 1910 Photo courtesy TCD. But aside from the historical significance, like the Asgard herself this little boat has a significance all of her own. Nowadays, with the ready availability of inflatables and small RIBS to act as safe cruising yacht tenders which can be stowed on deck, we've forgotten that in times past, cruising people had to make do with dangerously small rigid boats for tenders if they wished to stow them on deck. And if they wanted a high level of safety in their tender, they had to be prepared to tow it. In fact, in the 1930s, the Clyde Cruising Club had a rule that yachts racing in their annual Crinan to Tobermory Race, which marked the start of the traditional Glasgow Fair fortnight's holiday in July, were obliged to tow their dinghies. Much effort therefore went into designing dinghies which were safe yet sweet of line, and we've a classic photo of the great John B Kearney's 38ft yawl Mavis from Dublin Bay coming in to Tobermory in 1938 after winning the race from Crinan with the little dinghy under tow the whole way. John Kearney's Mavis coming into Tobermory Bay in 1938 after winning the CCC race from Crinan, and towing the dinghy as required by club rules. 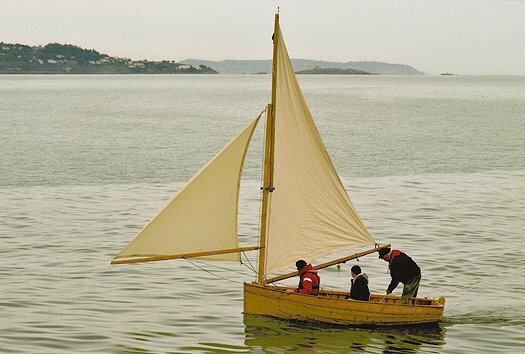 There's a direct link to the team connected with today's building of the Asgard dinghy, as the next photo we have is of Neville Maguire in his schoolboy short trousers rowing the Mavis dinghy in to the pier at Schull after placing second in the Irish Cruising Club's 1945 race from Crosshaven round the Fastnet. Neville Maguire in 1945, rowing the Mavis dinghy in Schull, with Skipper Kearney amidships. To work properly, these little dinghies had to be miniature masterpieces, and in re-creating the 10ft Asgard dinghy, Larry Archer had the devil's own job in getting the planking to take on the required twist in under the transom in order to match Colin Archers tightly turned lines, which enabled the little boat to carry weight, yet tow easily and lightly when unladen. In fact, he reckons that the original must have been built with a supple newly-felled tree, whereas he was working with timber left over from the Asgard conservation, and there was one split plank before they got it right for a very fine job. The boat wasn't designed with a centreplate, but she carried a little lugsail, and a rudder was fitted. Anyone who has ever sailed a clinker dinghy with the plate up will know that, from a standing start, she'll simply sail sideways. But if you get forward way built up, it's surprising how well the bit of lateral resistance provided by the rudder and the small amount of immersed hull enables you to make better to windward than just a beam reach, allowing all sorts of attractive little sailing options when the mothership is at rest in a pleasant anchorage. And if you do need to make real progress dead into the wind, she rows a treat. Windward work will be no problem at all with the new City One dinghies from Limerick. Looking at the workmanlike lines drawn by Theo Rye, who got to know Gary MacMahon of the Ilen Trust when they were working together in the Peggy Bawn publishing team producing the massive history of the work of designer G L Watson, the analogy that springs to mind regarding windward work by the City One is "Rat up a Drainpipe". These will be potent performers, well able to hold up their heads in any race fleet, and it has been a flash of inspiration by the Ilen team to go for this type of boat rather than some sort of conservative option which would provide a maximum number of berths afloat, but a rather dull sailing experience. By working in wood with the epoxy technique, they're getting the best of both worlds. But the Ilen organisation spreads its tentacles widely, and another of their wooden boat-building project is the re-creation of the classic Shannon and Limerick gandelows, which evolved a flat-bottomed hull shape to be able slither across those acres of mud which are inevitable at low water in the estuary, as Limerick has the biggest tidal range in all Ireland. Having been in the gondola-building boatyard on one of the Venetian islands (it's a marvellous old workshop, redolent with Stockholm tar and the aromas of fine timber), I have to concede that the Limerick gandelows are only a very distant relation of the classic Venetian originals from which they presumably derived their name. But the international brotherhood of traditional boatbuilding is strong, and the Limerick team will be taking their unusual craft to Venice on 30th April this year for racing displays. Meanwhile in Bray so many have been involved with the truly community-wide project to re-create the Droleen class that it might be unfair to single out any one individual, but the popular Barracuda restaurant (it's above the Aquarium on the seafront south of the harbour) has been hugely supportive of a project which has already seen the first boat sailing. She sets a fascinating rig slightly reminiscent of the setup on the first 1887 double-ended Water Wags. But where the Wags had a standing lug, the Droleens are gunter lug, with the foot of the gaff boom attached to a jaws which slides up and down the mast. Yet that startling spinnaker/jib matches the style of the original Wags, and it anticipates more modern concepts in that, in light airs at any rate, if you keep the spinnaker boom in line with main boom, you can continue to carry the "frontsail" with the wind well forward of the beam. The community group involved with reviving the Droleen class. The first boat will be taking part in Bray's St Patrick's Day Parade. In the urgency to get the boat sailing before the season had faded away completely, they got a temporary suit of sails stitched up by the fabric shop in Bray's main street, but we're assured that for the season of 2014 they'll have a grown-up suit of sails from noted local sailmaker Harry Sterling. Maybe so, but well done to the fabric shop, their temporary suit looks very well indeed, and the colour is just right to suggest cotton sails of the 1890s. The new Droleen sailing in Bray Harbour. The fact that this re-born design has also proven to be an ideal little workboat in on one of the rocky inlets of Connemara is yet another twist in a tale which clearly has legs. And yes, I'm well aware that there are several other wooden boatbuilders in Ireland producing interesting classic and traditional craft each in their own special way. But for now, the Asgard dinghy, the City One performance sailer, the Limerick Gandelow, and the Bray Droleen have given us more than enough to be going along with.